May is probably the sexiest month of the year in England. When Guinevere sings about May in Lerner and Loewe's Camelot, she could be singing the praises of ancient pagan festivals and traditions, celebrating the mating game, that continue to this day. Before May Day became entangled with international left wing politics, it was associated, throughout England, with all things fertile, green and juicy. While you can usually expect some large protest marches supporting the current crop of urgent causes in the larger cities, in the smaller villages of England, especially those of the south and southwest, it's a time for letting one's hair down and celebrating the most primal forces of life. The month kicks off at dawn on May 1 in Cerne Abbas, a small village north of Dorchester in Dorset, when the Wessex Morris Men, along with various new agers, neo-pagans and other mystical types dance above the Cerne Abbas Giant, the UK's most suggestive landmark. The schedule and participants for 2019 had not yet been announced at the time of this writing (February 2019), but if previous year's events are anything to go by, the Morris dancing begins at 5:15 a.m. May Day morning. The giant is sometimes also called The Rude Man. The procession of celebrants then dances down to the village where, at 7 a.m., there is more dancing in the square followed breakfast at the pub. Check the Wessex Morris Men's website in April for up to date details. To join in, find the tiny village, just off the A352 and simply follow the crowds. Watch a video of the event. May Day revels among the huge student population of Oxford go back hundreds of years. It all begins the night before with parties, some private, some in the pubs and clubs. The biggest one is usually an open air party in Port Meadow, an area that has been park and common land since the Middle Ages. Dancing, for those with the stamina for it, goes on all night. Just before dawn on May 1, Morris Dancers, with their bells and ribbons, "dance in" the day and the crowds move on to the area around Magdalen (pronounced maudlin) Bridge. At one time, there was a tradition of revelers jumping from the bridge into the Cherwell River. But the river is only six feet deep and, after several injuries, the bridge was closed. Get to the bridge early for a good spot: At dawn, the choristers of Magdalen College, a traditional English boys choir, sing a Medieval Eucharist Hymn from the college tower and the crowd is instantly hushed. No one knows exactly when the May Morning tradition began, but there are records of it going back to the 1600s. Then, following the singing, the bells of the Great Tower ring out over the city for about 20 minutes. Finally, the now subdued (and likely exhausted) crowds disperse some to breakfast picnics and ball games, others to the many Oxford pubs that have special licenses to open early on the day. Villages all over England have their own local May Day traditions, often built around maypole dances, Morris men, the crowning of a Queen of the May and the revels of the Green Man or Jack-in-the-Green, an ancient woodland spirit. The Minehead Hobby Horse a dummy horse and fertility symbol rampages through the streets of the Somerset village of Minehead for three days around May 1 (the event can start on April 30 for example) accompanied by noisy musicians and a rowdy crowd that is rowdiest on the last night. The Hobby Horse accosts passersby for donations and embarrasses those who don't pay up.There are two "Hobby Horses", the Town Horse and the Sailors Horse. both put together with colorful imagination by local participants. Traditionally, if May Day occurs on a Sunday, the Hobby Horse doesn't appear but takes a day of rest. The Padstow Obby Oss comes out of its stables, near Padstow Harbor on the morning of May 1 accompanied by singers, dancers, and musicians. 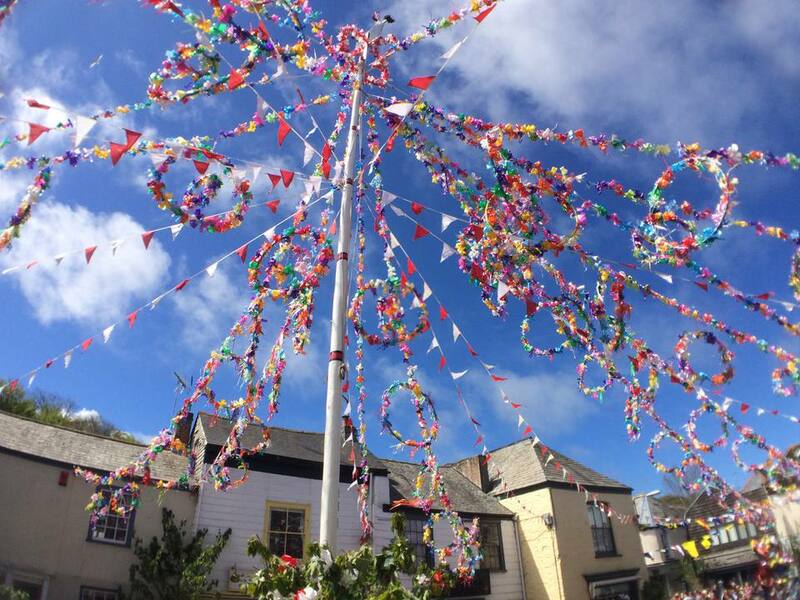 The parade goes door to door, up and down this north Cornwall town's narrow lanes and attracts thousands of spectators - the Obby Oss has a licence to embarrass bystanders and even dances into private gardens. Traditional forest greenery -- hazel catkins, bluebells, cowslips, forget-me-nots and sycamore twigs decorate the village. If May 1st falls on a Sunday, the event is held the following Monday, (perhaps because it predates the church and is a pagan revelry). In 2019, May Day is Wednesday so no need to worry. The Helson Flora Dance takes place on May 8 and is thought to be one of the UK's oldest May Day traditions. From 7 a.m. until after 5 p.m., the people of this Cornish village dance in the streets. There are several different dances, including a children's dance that involves as many as 1,000 children, dressed in white and garlanded with lily of the valley. In Victorian times, the Helson Flora Dances were banned. The Gawthorpe Maypole celebrations in Yorkshire, include the crowning of a May Queen, maypole dances and a parade on the first Saturday in May. Their website is infrequently updated, but since this event has taken place, pretty much without interruption, for nearly 150 years, you can expect that the general description of the festivities is pretty accurate. Information about Maypoles and May Day celebrations is often maintained by local volunteers and small, community websites that are infrequently updated. It's a good idea to use the contact details they provide to double check on locations and times.